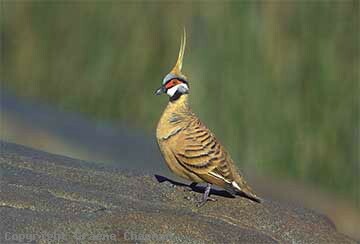 The Red Spinifex Pigeon is currently classified as a subspecies of the widespread Spinifex Pigeon but I have listed it here as a full species following the arrangement in the 1926 RAOU Checklist - it is remarkable how many of these "species" from that time have been re-instated recently in the light of more research. 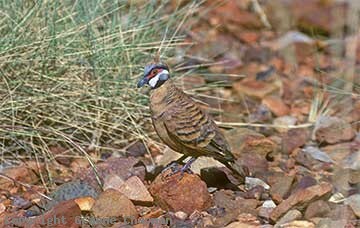 The core range of the Red Spinifex Pigeon is the Pilbara region of W.A., from just south of Carnarvon north to the De Grey River. 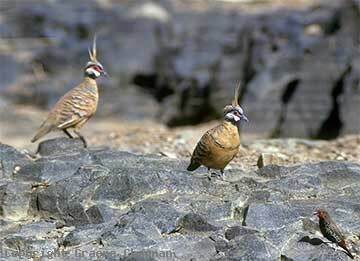 In some southern parts of the Kimberley region such as around Fitzroy Crossing, in the Rawlinson Ranges and the Edgar and Grant Ranges there are some interesting apparently intermediate forms between ordinary Spinifex Pigeons and their red-bellied counterparts - these are discussed on p266, Vol. 1 of the excellent Handbook of Western Australian Birds. 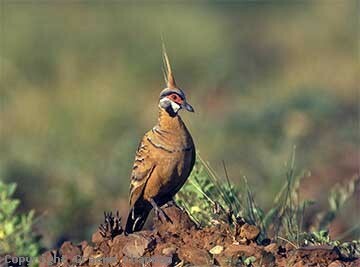 042202 ... Red Spinifex Pigeon, Maitland River, W.A.